Many older houses with suspended timber floors have big draughts and inadequate floor insulation; this can cause cold feet as well as higher energy bills. Installing underfloor insulation can address both these problems and give a payback on your investment in 5 years or less depending on whether you do it as a DIY job or use a professional. This article discusses the options for insulating suspended timber floors and the author’s experience of insulating the floors of a 1930’s house . 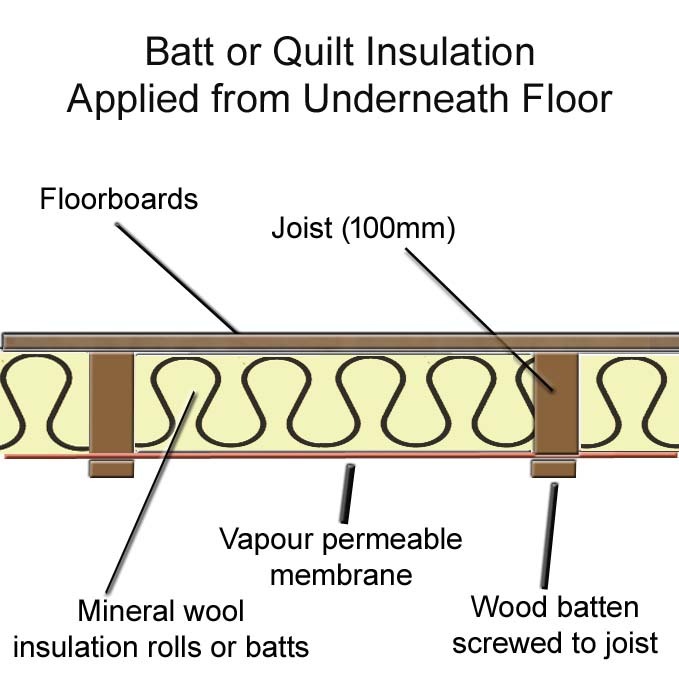 Why insulate a suspended timber floor? heat loss from draughts through things like gaps in floors, windows, doors, open chimneys and loft hatches. In a very draughty home, heat loss through draughts can actually exceed the heat loss from the fabric of the building. Insulating a suspended timber floor can eliminate floor draughts and reduce heat loss through the fabric of the floor at the same time. Why are some suspended floors cold? The space under a suspended floor is designed to be well ventilated to avoid the build up of damp. So it is no surprise that the air under the floor is close to the outside air temperature; on the coldest days this air could be below freezing. Properties built after 1920 generally have air bricks built into the external walls to get a good cross flow of air to allow the sub-floor area to be ventilated. 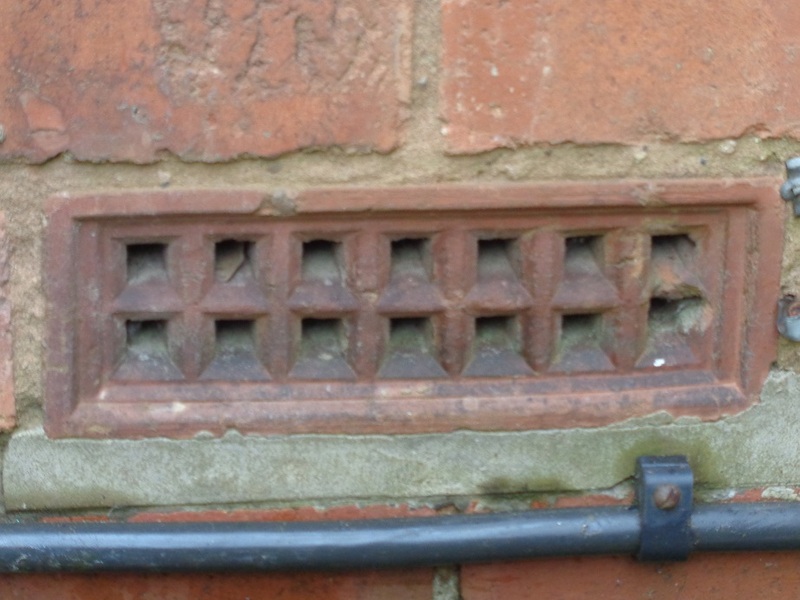 Properties built pre-1920 often didn’t have air bricks for ventilation or a DPC (Damp Proof Course) so damp may be a problem that needs sorting before you think about floor insulation. Suspended floors in older houses often have some damage in places; a result of raising floor boards when new central heating pipes were run or the house was rewired. Note the big gap to let cold air into the room. 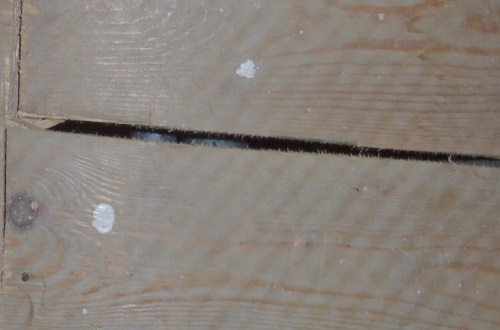 Some floorboards can warp over the years creating gaps. The cold air from beneath the suspended timber floor then comes through the damaged floorboards, making the house and your feet feel cold. Even good condition suspended timber floors can suffer from cold air coming through gaps in the skirting boards. You can see the tell tale staining of the carpet round the skirting boards as air from under the suspended floor continuously flows through the carpet. Laying a laminate floor in a room can cut out many of the draughts but it will not dramatically reduce heat conduction and it can be a real shame to cover up some splendid wooden floors found in older properties. Carpets can also make a difference but they are not air tight and they will not fix draughts through the skirting boards. Air can seep through the carpet, even if it has an underlay, bringing with it dirt and dust which can discolour the carpet if it is a light colour and depositing dust on the skirting board. If this is a problem then 3mm thick hardwood sheets can be fixed down under the underlay and carpet. Gaps between floorboards can be sealed with varnish or sealant and the gap between the skirting boards and the floorboards can be filled with self adhesive foam strips. We all know that heat rises, so at the same time it is worth thinking about improving loft insulation and also eliminating any draughts through the ceilings. You can get big benefits from making sure that the loft hatch is not leaking hot air into the cold roof space. The combination of cold air through the floors and hot air out of gaps in a loft hatch can lose heat very quickly. If you can feel a strong draught as you go up the stairs then there is probably some opportunity to reduce heat loss upstairs. insulate from under the floor by using the crawl space underneath (to crawl). or there is a sufficient gap under the joists to use the crawl space to actually crawl. In practice that means there are about 5 or 6 bricks below the bottom of the joists (38-45cm or 15″-18″ of space). I have tried both methods and on balance would go for the underfloor insulation option in most cases as it creates far less mess and disruption although it does require you to learn some potholing skills. See Insulating A Suspended Timber Floor From Underneath The Floor. If a house is being refurbished or is empty and the floors are in poor condition then ripping out the existing floors and insulating from above would be easier. Where the crawl space is limited on non existence then you may be forced to remove the floorboards or compromise and go for a less ideal option. Celotex / Kingspan type PIR thermal insulation board. This comes in various thickness (50mm and 100mm are the most common) and in a variety of sizes (2.4 x 1.2m being the most common). An U-value is a measure of the thermal insulation of a material with lower U-values being more effective insulators. For a material which is a worse insulator you need a greater thickness of the material to achieve the same U-value as a better insulator. The PIR thermal insulation board is the best insulator but it can be a bit more expensive. The boards are quite big so to transport them you need a van or lorry or better still get them delivered. They need to be cut to size before installing between the joists. Measuring and cutting them is very easy with a small handsaw outside but it becomes a little more difficult when you are on your back under the suspended floor with a face mask on. 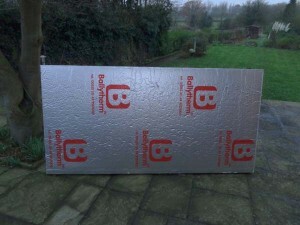 The boards are faced both sides with aluminium-foil to form a vapour control barrier to stop damp. Battens fixed under the board hold it in place or a plastic friction fit support can be used. The method of supporting is the same whether done from above the floor or underneath. Mineral wool insulation comes in roll or batts (slab form). It is cheap but not as good an insulator as PIR thermal insulation board and is a pain to cut to the right size. If you can get the right width to match the joist spacing and the joists are spaced evenly then it can work well. It the floorboards have been removed then the insulation material is held in place with netting underneath (or a vapour permeable membrane) and then a vapour control layer (VCL) is applied above the joists. 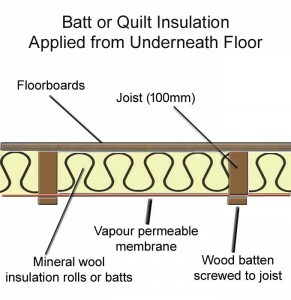 If the work is being done from underneath then the insulation can be held in place with either tongue and groove boards or with a vapour permeable membrane. I have seen examples where netting is used from underneath but this is not considered so effective at eliminating draughts. Natural materials such as wool are more pleasant to handle than mineral wool and are considered superior for older buildings by those that know (English Heritage) as they allow the floor to “breathe” and buffer the moisture reducing the risk of damp. Where you are fighting lack of underfloor ventilation and the lack of a DPC then this could be the best option. It is installed in a similar way to mineral wool insulation. After considering the options, I chose PIR thermal insulation board as it was the best insulation that would fit between the 4″ (100mm) thick joists. The first room I tackled was the lounge and decided to take up the floorboards to install it. See See Insulating A Suspended Timber Floor From Above Floor. We were so pleased with the impact the insulation had on the room I decided to insulate most of the rest of the house (the area accessible from the crawl space). As we had the original oak floorboards in the hall and Amtico vinyl in the kitchen and utility area there was no real option of removing the floorboards. Also I had the opportunity when doing the lounge to explore the crawl space under the rest of the house and realised it was possible to do from underneath. I had built an access panel in the lounge which allowed me to access the crawl space very easily. See Insulating A Suspended Timber Floor From Underneath The Floor. Hi After reading this article 3 times I have asked for pro advice my local guy and the main problem is not the U-value, but draughts. Also FYI Kingspan can be installed only when you lift the floor than finish with foam (tones of it if the floor is not even, fire proof pink foam). If you do it from under the floor use mineral wool. I have done it this way and the difference is 3-4 degrees in my house on the ground floor, Kingspan is to be used on the walls, it has to be covered with drywall to be safe for fire regulations, so when you will do Home report you may get a surprise, also may not be impressed when it comes to home insurance payout, Only mineral wool is fully non-combustible. Celotex is said to be 30% to 50% cheaper than non-combustible mineral fibre insulation, but is it really worth it? I would suggest to speak to your local council before you do this. Standard plasterboard has a 30 minute fire rating so you can use Kingspan, but your timber floor, just like mine has very poor fire rating, so if the producer of Kingspan didn’t design it to be used this way and there is no another plasterboard covering it from both sides be careful and ask for professional opinion before installation. Quality mineral wool will stop draughts as you can push it near walls and will work really well in the cold days and it is much cheaper. Remember to put a net and staple it to hold it nicely. It will also stop air, wind and high air pressure coming with storms and pushing this cold air all the way up to your house. Do u cover Peterborough at all pe2 8td 1930 bungalow with crawl space of 4ft under floor.roof has been done walls also completed. House is very cold and requires a breathable solution for the floor. We insulated under our 1800 year old granite farmhouse boarded floor with garden netting and mineral wool when new flooring was put down. Just recently – say 5 years on and we are getting damp floor boards in one gable end room. Could it be the mineral wool touching the wooden boards that’s causing the damp? We didn’t use any membrane to stop moisture transfer. Any help appreciated plz before we attempt taking up the boards! I need to insualte my cellar roof, but the cutting is going to be long and difficult as the joists are different sizes and angles between each one. Would there be benefit stapling thermal foil to the bottom of the joists? However this would leave a gap still. If it’s sealed up well would this provide any benefit? Thanks in advance. Keep up the good work! Hi Andy, Thanks for the feedback. Good luck with the insulation. If access from the cellar is not a problem amd you have problematic angles on the joists it may be worth considering mineral wool with a breathable membrane to support it. Although rigid board is my preferred solution as it offers the best U-Value and it helps to stop air infiltration, it can sometimes be easier to work with something like mineral wool that you can stuff into difficult areas. The membrane supports the wool as well as providing a reduction in draughts. It does create its own challenges in terms of handling and fixing. Using rigid board you do need to fill any big gaps with expanding foam as otherwise you will lose heat via air infiltration. I did use aluminium tape to cover between the joists and the rigid board and this would reduce air infiltration through small gaps. On your question on thermal foil stapled to the bottom of the joists I’m afraid I haven’t got a particular view. Generally low emissivity materials such as foil are used to reduce radiant heat losses in unventilated airspaces such as a cavity (or a small gap as described above). According to CIBSE Guide A (the bible as far as these sorts of things are concerned) in a 25mm unventilated cavity it can increase thermal resistance from 0.19 to 0.50 m2K/W which is a significant improvement. However I have no reference data on ventilated airspaces so suspect the benefit would be marginal with the airflow being the biggest factor. Maybe another commenter with more expertise in this area would be able to offer further insight. I would be slightly nervous of the foil preventing any moist joists from drying out from below but it depends on the dampness and airflow in your cellar. Hi Stuart. Thanks for your comments. I would struggle to comment on the technical benefit of foam backed radiator reflector. My experience of heat calculations on low emissivity materials is when an air cavity is involved so not sure how to approach it when there is no air gap. I like the idea of draught excluder; that seems a good solution if you run a batten the full length of the insulation edge along the joist. Generally I have just used short battens at 90 degrees to the joist as support for the rigid board and then filled large gaps with expanding foam and taped the joist/board link with aluminium tape but I can see the attraction of running draught excluder it the full length. I think any method that stops air flow (ventilation heat losses) is going to help, whether it’s tape or draught excluder. Thank you for a great article and insight to how to go about the job using different insulation materials and different methods. Also big thank you to Miles for pointing out issue of thermal bridging through the joists was bugging me for some time. I was thinking of the solution to thermal bridging and below you will read how I would like to eliminate to certain extent thermal bridging. The floor to be insulated rests on 4 brick wall supports with gaps here and there to allow for air circulation. I would like to screw few metal brackets to the walls supporting joists and place PIR board on them. Seal any gaps on the sides with expandable foam. PIR board is underneath and across the joists. There is still about 20cm of space (after fitting PIR board) for the air to circulate u see the floor. Because the PIR board is on supports I would place mineral/natural wool or other on the roll insulation in space between the joists resting on PIR board. Original wooden boards will go back on top and large gaps between the boards closed with pine sleepovers. Now thermal bridging occurs on much smaller scale and only in places where joists are resting on brick wall supports. What do you think? Is there a risk of condensation and damp? I would really appreciate you opinion and thanks again for a great article. 2. After fitting PIR boards there is about 20cm gap for air to circulate underneath the insulation. Hi Jon, the entire ground floor of our 100 y.o. home was raised some time before we bought it. They used chip board on brick piles for the new floor.. The gap below the raised floor is about 35cm. We want to lay reclaimed floor boards over the chip board to match the upstairs. Your article is really interesting but unfortunately I’m still unsure how best to go about insulating the floor! Any help would be very appreciated. I am currently renovating a 70’s detached property. Floorboards are all up and new to be installed. I have read so much and very confused as to the best way to insulate the floor space. I’m edging towards using netting to support and then rock-wool insulation between the joists. My confusion is where to put (if any) and what type of membrane to use. Am i right in thinking to use a breather membrane above the insulation and below the new floorboards? Or should it be a solid DPM type membrane? I can appreciate your confusion. The basic idea of a suspended floor with a cavity underneath it is to allow air to circulate over the joists to remove any moisture so the joists stay dry and do not rot. The choice of membrane needs to allow air around joists to escape to the cold side. 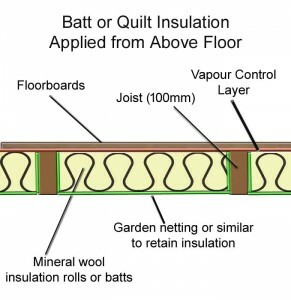 a) If you are insulating from above as you describe then you use a membrane to block moisture (what they call a vapour control layer which is impermeable to water) and put it above the insulation and below the new floorboards. When insulating from above this is the only practical way of doing it. So any moist air is removed by airflow from underneath the joists. b) When insulating from below without removing the floorboards then a vapour permeable membrane is used below the insulation to both retain the insulation and to make sure that it does not lock any moisture into the joist area. The other big benefit of using either a vapour control layer or a permeable membrane is that they both reduce the airflow through cracks in floorboards; much of the heat in a suspended floor is lost through ventilation or airflow rather than thermal loss through the fabric of the boards. The benefit of using rockwool as you plan is that you can push it into irregular shaped areas. I personally prefer rigid board type insulation such as Celotex as it has a vapour control layer built in already although any joints would need to be sealed with aluminium tape. However it is more about what you are familiar with and what materials you prefer to work with. If you are in a very old property with a high risk of damp then often sheepswool rather than rockwool is used; although it is much more expensive it provides better insulation when exposed to extreme moisture. Whatever material is used it is important to examine the underfloor area for damp and address these before insulating. Air bricks should be cleared of debris to allow good airflow. Air bricks should be positioned to allow cross ventilation; ideally from all four side of the room so that air flows in one end and out the opposite wall. I’d like to make a couple of technical points to add to the description above, to help make the choice between different insulation materials. 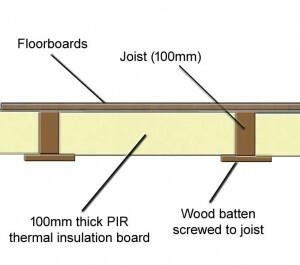 The first point is that the high performance of PIR type boards make very little difference when the joists are bridging the insulating layer, as drawn so neatly in the article. The timber is a much worse insulator than the PIR, and with 50mm wide joists at 400 centres, 12% of your area is conducting through the joists. Everyone’s heard about thermal bridging, but the point here is that it can easily make a mockery of buying expensive “high performance” insulation for the bits between the bridges. There is a simple formula for the resulting U value of a bridged layer (U= (fractional area 1/R-value for area 1) + (fractional area 2/R-value of area 2)) – if you consider 100mm PIR boards of R~4, and 100mm joists of R~1, then the overall U value of the floor ends up at about 0.34 (neglecting surface resistances and the floorboards themselves). If you had a continuous sheet of 100mm PIR below the joists, the U value of that board alone is 0.25. So the ‘bridging’ effect has reduced the insulation value by over 25%. Without going through all the numbers, the very high cost of PIR board is very hard to justify if it is being bypassed like this. The second issue with rigid boards is that getting a leak-free fitting between joists is impossible unless you use expanding PU foam to fill any of the inevitable gaps (I’ve done this job, and I’m handy, and it’s just not realistic to cut a 100mm-thick foam board accurately and dead square to +/- 1mm – and the old joists will NOT be perfect either!). If there are gaps, then the air blows through and your expensive board might as well not be there. I recommend looking at some of the semirigid rockwool type products like Knauf “earthwool building slabs” – these are springy and self-supporting, cut very well with the same type of ‘breadknife’ saw that is used for cutting PU boards, and because you can cut them a few mm oversize and they just compress to fit the gap, you can get much easier leak-free fitting with far less effort. They are available in lots of different densities, the heavier ones are designed to have more noise absorbing ability, and are also fireproof (unlike PU or PS). I’ve no connection with Knauf/others at all, just had a good experience of using this product in this way. You STILL need a layer of insulation below the joists if you want to prevent bridging, but I really do think that trying to fit PU boards from underneath a floor is a very risky, awkward and expensive option! PS if you are cutting PU or PIR boards, take GREAT care not to get the dust in your eyes – it is extremely irritant and can really spoil your day. Thanks for the considered feedback. I totally agree with your comments on the heat loss through the joists, which is going to pull the u-value down whatever insulation material you use. I have yet to see a good way of overcoming this when insulating from above. Even when working from below insulating over the joists is problematic, unless you have very easy access to the underside of the suspended floor from a cellar which is rare in most houses. The reality is that if you have a suspended timber floor then the u-value before insulation is going to be upwards of 1.5 so achieving 0.34 W/m²K is actually quite a result. The precise u-value of the original timber floor alone is a slightly academic debate, as often huge amount of heat will be lost through air infiltration through gaps etc rather than fabric heat loss and insulating reduces both of these. Using rockwool is a good option, particularly when insulating from above. I think the main debate would be over whether this is more or less airtight than a rigid board material which is gap filled with expanding foam and then taped. I haven’t seen any data one way or another but generally when using rockwool the recommendation seems to be to add a vapour control or vapour breathable membrane (depending on which way you are working) and this is partly to reduce air infiltration. This is extra activity and cost. In a refurbishment I would certainly just rip up the floor if it had no aesthetic value, insulate from above and if necessary add a vapour control membrane (rigid boards have this built in) and then replace the floorboards with my preferred floorcovering. Insulating from under the floor is really only for the adventurous who don’t want to destroy existing floor coverings. I don’t see many insulation businesses offering this service as it is akin to potholing and tough work, particularly with a mask and goggles. For those undertaking it on their own homes it is more a judgement on which material is easier to work with and will take least time rather than simply material cost. Once you get to know how to use one material then you do get the experience effect. I did consider rockwool for underneath but actually getting a vapour control layer or breathable membrane in place to reduce air infiltration seemed tricky as I was working in cramped conditions with maybe a 45cm space under the floor with a roll of heavy material. You have to work round any existing heating pipes running under the floor as well as getting into cramped spaces. Also you need a way of pushing the rockwool into the space and then keeping it there with gravity working against you. No doubt someone has come up with a good technique for using the breathable membrane from underneath; I would be delighted to hear from those with good solutions for this. Very often people seem to end up with strawberry netting to keep the insulation in place but this does not stop all of the air infiltration and I am not sure how consistent the insulation coverage will be. First off thanks for making the site and the guide as its a job that i am looking to do in the near future. To follow on from Miles comments the bridging in the joist will limit the effectiveness of the insulation, but the choice of material does make a large difference in overall U-value of the floor. Looking at a comparison of 100mm PIR (GA4100 R = 4,5) and 100mm mineral wool (R = 2.6), in a suspended timber floor. Running this though the celotex U-value calculator (mineral wool modelled as 60mm celotex R = 2.7) in accordance with BS 13370:2007. The results for the suspended floor are 100mm PIR U-value 0.24, and 100mm mineral wool U-value 0.34 (both assuming 12% timber joists). So the choice of material does actually make a big difference, and buying premium at 1oomm thickness is not at the point of diminished returns. Installation issues that is another matter! My question is more about noise reduction. Since new neighbours have moved next door to our 1930s semi the noise really carries, they have ripped all their carpets out, re-wired but not plastered and have a toddler. The running around feels like a constant hammer thumping in our living room. I am on the path of noise reduction and thought I’d start with the floorboards, I bought expanding foam in the hope of drilling through the floorboards next to the skirting and filling up with foam to block any gaps, but it just fell straight through (and now reading your website, and locating air bricks to the front of the property realise why). Sorry if this is a silly question but would the semi’s share the same floor joists or would the party wall cut through the joists? (if they share the same timberwork then it may explain why the footsteps carry on the ground and second floors) And would I be better off sealing gaps in the floorboards with decorator’s filler? I am in the process of carpeting the insides of my cupboards to try and stop the noise! I can do a bit of DIY and trade-people are scarce or notoriously unreliable in our area so I am looking at doing something basic myself to damp the noise if you can advise. Hi Chris, thanks for your query. I don’t have much practical experience of this type of issue. I’m guessing that your party wall is solid brick and that the joists in each property are supported by the party wall. Around the 1930s this was often done by having gaps in the brickwork which the joists were placed into for support, rather than a separate sleeper wall. I would be quite surprised if it was one continuous timber between the two properties; there would be extra unnecessary cost and handling issues with having longer timber for no benefit. The joists could be sitting quite close to each other on common brickwork. I am not sure that decorators filler would really achieve much in terms of noise reduction. You really need to damp the sound in some way. If it were me and most of the sound really is coming through the floor then thermal insulation under the floor would be the way forward. Noise between solid party walls like this is nothing new; hearing the neighbours conversations through the party wall is a feature of this type of property! There are also various acoustic insulation products that can be applied to the walls – they would normally be covered with plasterboard or another material after installation. See: https://www.wickes.co.uk/Wickes-30mm-Acoustic-Insulation-Slab-3-6m2-Pack-5/p/161189 as an example. Hope this helps with your quest for a quieter life. We are currently installing UFH in an early 1970s house, it has suspended floors. We have used the old floorboards to support the PIR insulation board 90mm thick.. The original vents were just below the floorboards so we have had to use periscope style vent to let the air under the insulation board due to the ground level outside. The problem we have is the underside of the boards supporting the insulation is damp. The original vents we found were half blocked due to rockwool that was pumped into the walls but they space was still very dry now since we started to insulate its not. I can add extra vents, where a room had 2 vents I can have 6 in total. Some areas due to the layout of the house we can have vents but cannot get cross flow of air. My questions are the periscope vents as good and will enough air flow. Do we need to install a fan in addition to move the air around. Below the PIR Board is about 14in deep of space. My fear is that once we install the UFH if we have any problems they will be hidden and may cause huge problems in the future. I am sorry now we did not fill the space with cement. A damp board could curve up and damage the UFH pipes and the screed. Once we close up the space we cannot check to see how dry it is. Will the space dry out over time? I am currently using a dehumidifier to remove some of the moisture. I have read about other houses but many have a larger space and have used spray foam. The space will be sealed very tight once the heating system is installed also the floor will then be warm, I assume and this may cause more moisture. I could use a fan at night during the winter months and avail of night rate electricity. It may not need a fan during the summer, I’ve no idea whats best. Any advice would be greatly appreciated. Thanks for your comment. In older houses it can be a challenge to insulate to get warmer rooms without creating other problems. By insulating above the suspended floor you have reduced the heat loss through the suspended floor. This is a good thing to do but it does mean that the cavity below the suspended floor is now colder and consequently there is more risk of condensation without adequate air flow via the air-bricks. I have not seen any airflow data on the advantages of houses using periscopic ventilators but in theory they should be no worse than conventional air bricks and are actually designed to have more airflow. They have the added advantage that they can be raised slightly higher above the ground so they don’t get so blocked with earth, foliage or other debris. Having more rather than fewer vents will move the moist air faster so should reduce damp. Your 14″ depth of the space beneath the floor sounds pretty typical and for this depth the advice is that vents should be spaced every 1.5-2m around the outside wall. With all things related to building it does depend on site conditions so if your house is in an area highly protected from winds then I would err towards the 1.5m level. Having airbricks at either end of the underfloor space is the best solution. Fan’s are generally used when the cavity under the floor is bigger as air bricks may not be able to move a big volume of air. They are also used where it is not possible to use the right level of air bricks with cross ventilation. It’s hard for me to say what the airflow characteristics of your own space will be but most houses perform well to the above guidance. A good source of advice on this is actually a pdf document regarding radon solutions in homes which may give you more confidence on deciding whether fans are neccessary. Hope this helps and all the best with your project. I am sure you will enjoy the warmer rooms. Nice article, installing underfloor insulation may not be very cost effective or save you money in the long run, but it is certainly very comfortable for people living in the house.